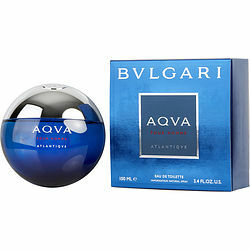 Experience the freshness of sea breeze and tranquility of clear waters with Bvlgari Aqva Atlantiqve for men. Opening with bergamot and water notes at the top, this Bvlgari perfume is reminiscent of the ocean?s energy. Apple and sea notes lead liveliness in the middle, while the trail is woody and earthy with Sandalwood at the base. A vibrant and sparkling blend of heady and lasting tones, this masculine fragrance is perfect for wearing every day to work.